i just had to share some pictures of this adorable little person. She’s the daughter of a friend and as cute as can be. She asked for a pig hat and a bear hat and here they are! Last weekend was amazing! We were in New York city for my brother Mike's wedding. He married the love of his life, Jeannine. Truth be told, they've been married before and just couldn't stay away so after a number of years, they re-married! Everything was fabulous. Cocktail party, carriage ride in Central Park, swanky wedding, brunch on Sunday. Not to mention the wonderful family time as both our families reconnected after many years. We just did our fist show last night at WineART Wednesday in Lake Mary, FL. It was only 3 hours long so it gave us a good taste of what it's like to sell in person. We did pretty well considering it was a sort of a trial run! Our booth seemed to be a big hit and people loved the items. Makes me so happy because they really are a "labor of love". 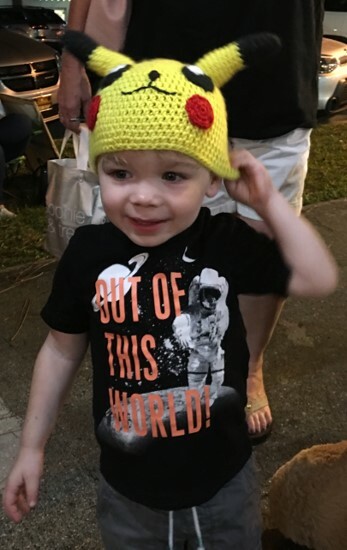 And just look at this cutie who got the Pikachu hat!